A senior Liberal cabinet minister denied Tuesday lobbying on behalf of one of the country’s leading shipbuilders, which has been swept up in the court fight surrounding the military’s former second-in-command. A senior Liberal cabinet minister denied Tuesday lobbying on behalf of one of the country's leading shipbuilders, which has been swept up in the court fight surrounding the military's former second-in-command. 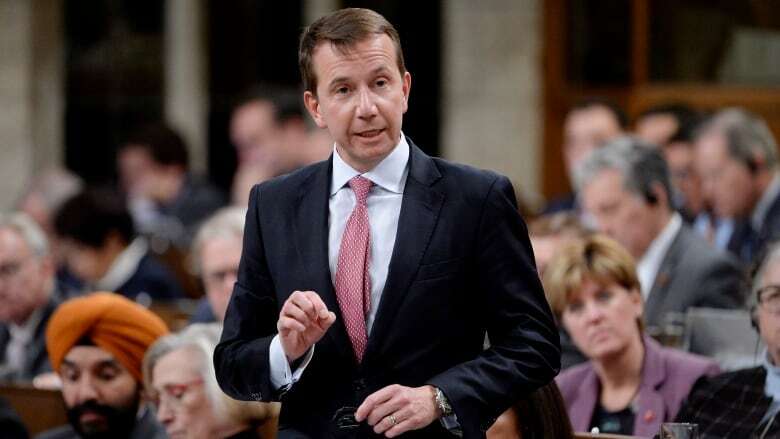 Treasury Board President Scott Brison faced a second day of questions in the House of Commons over what contacts he had with Irving Shipbuilding of Halifax prior to a key cabinet committee meeting at the heart of the criminal case against Vice-Admiral Mark Norman. Court documents filed last week alleged that Brison had a "close relationship" with the shipyard and that he was fronting an effort to scuttle a proposal from rival Davie Shipyard, of Levis, Que. in the fall of 2015. "The only engagement I had with Irving Shipbuilding during the period in question was being copied on a letter sent to two other ministers," he told the Commons, referring to a letter the company sent to four cabinet ministers, extolling the virtues of their proposal. "My job as Treasury Board president includes expenditure review and due diligence to ensure the integrity of government contracting. That is exactly what I did, my job." The political, bureaucratic and corporate tug-of-war over acquiring a leased supply ship for the navy is underpinning the Crown's case against Norman. Prosecutors allege the former vice chief of defence staff favoured a $668 million proposal by the Davie yard. When the newly elected Liberal government wanted to pause the project, Norman allegedly leaked word of the secret decision of the cabinet committee. The ensuing political uproar over the possible cancellation forced the Liberals to back down and the ship was eventually completed and has now entered service. The leak to CBC News became the basis of an RCMP investigation. The reporter who wrote the story, James Cudmore, left journalism shortly afterwards and went to work as a policy advisor in Defence Minister Harjit Sajjan's office. The disclosure motion, which has put Brison in the crosshairs of the Conservative opposition, was filed on Friday by Norman's lawyers who are asking the court to release a trove of secret and confidential documents related to the handling of the leased supply ship program. The prime minister's office, according to the court documents, is blocking the release of the information. Conservative House Leader Candice Bergen said officials were "in essence, obstructing justice" by blocking the naval officer's right to a fair trial. Public Safety Minister Ralph Goodale said he wasn't prepared to comment about an ongoing court proceeding. "Due process will apply and justice will be done," he said. "I am sure the honourable member knows that criminal prosecutions are not pursued on the floor of the House of Commons." The Conservatives, however, countered that the case had already been politicized by Prime Minister Justin Trudeau, who on two occasions, before charges were laid, made remarks which Norman's lawyers seized on in the court filing. Asked about the investigation on April 6, 2017, Trudeau said he believed the matter "will likely end up before the courts" and then on Feb. 1, 2018, he stated the RCMP investigation would "inevitably" lead to "court processes." Lisa Raitt, the Conservative deputy leader, said Goodale is trying to hide behind the court process by saying it's improper to comment. "Maybe he should tell that to the prime minister who deemed even before an investigation had concluded that the admiral would be charged," she said. "For a government that is in love with the Constitution, I really thought it would understand that the right to a fair defence and the right to procedural fairness of the individual would trump their desire to hide some uncomfortable things that were probably said at a cabinet meeting. Why is the government putting its self-interest above somebody's defence?" The Crown and Norman's lawyers will be in court Nov. 2 to argue over the disclosure of documents. A trial is not expected until next summer.